The EF16-35mm f/4L IS USM is Canon’s first ultra-wide L-series lens to feature Canon’s signature optical Image Stabilizer (IS) technology, offering a four-stop advantage over non-IS lenses, helping to ensure that shots are always captured with precise detail. Designed to deliver the highest image quality, the lens’s optical structure includes two Ultra-low Dispersion (UD) elements to minimise chromatic aberration and eliminate colour blurring plus a newly-designed IS system features gyro sensors for greater accuracy and stability. This high performance, fixed aperture, ultra wide-angle zoom lens combines excellent optical performance with flexibility, making it ideal for landscapes, architectural shots, photojournalism, travel and general use – delivering clear, sharp, expansive images with very little distortion. The compact nature of the EF16-35mm f/4L IS USM means it will perform superbly in confined and challenging situations. The L-series reputation for unrivalled construction, design and – fundamentally – optical quality is immediately clear to see in the EF16-35mm f/4L IS USM lens, and thanks to its new optical Image Stabilizer photographers will have an added four-stop advantage as well as a constant f/4 maximum aperture. The new EF16-35mm f/4 IS USM is weather resistant and offers a 4-stop advantage thanks to Image Stabilizer technology. Ultra wide-angle 16-35mm zoom range. Superior L-series performance with precision EF optics. Sharp, high-contrast images with UD lens elements and Super Spectra Coating. Silent, high-speed autofocus with full-time manual override. Easy attachment of filters with non-rotating front element. The EF16-35mm f/4L IS USM incorporates three aspherical elements to ensure corner-to-corner sharpness and clarity throughout the focal range. Two UD (Ultra Low Dispersion) elements virtually eliminate chromatic aberrations. Super Spectra Coating ensure accurate colour balance and enhance contrast. They also reduce flare and ghosting – a common problem caused by light bouncing off a camera's sensor. Fluorine coatings prevent dust and water droplets sticking to front and rear lens elements to help ensure optimum image quality. A constant f/4 aperture throughout the zoom range of the lens allows for excellent image reproduction in low light. It also enables the use of slower shutter speeds and can be used to creatively isolate subjects from the background. 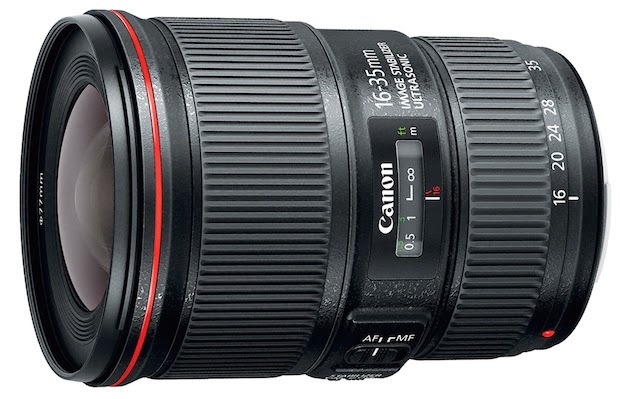 The EF16-35mm f/4L IS USM adds to Canon’s range of f/4L series lenses which offers a series of lenses providing a range of focal lengths 8mm to 400mm. A ring-type ultrasonic motor drives autofocus extremely quickly, and in near silence. Excellent holding torque ensures the point of focus is reached accurately, without overshooting. A high-performance CPU and optimised AF algorithms provide an ultra-responsive and accurate performance in all lighting conditions. As well as its fast AF system the lens also offers full-time manual focusing, even during AF. This helps to ensure that you can accurately and precisely fine-tune the autofocus and stay in control. A newly designed Image Stabilizer unit detects and automatically compensates for unwanted ‘camera shake’ when shooting handheld and in low light, providing the equivalent effect of a shutter speed 4 stops faster without any perceptible increase in image blur. The lens does not feature an IS mode switch, but instead automatically detects traditional shooting or panning motion via output from the gyro sensors, and then switches to the IS mode optimal for either shooting situation. It also includes tripod detection, switching off IS automatically when the camera is mounted on a tripod for optimum image quality. When a monopod is used the Image Stabilizer is controlled in the same was as for handheld shooting. A 9-blade circular aperture gives out of focus regions a softer, more uniform feel – so your foreground subjects stand out sharply against a beautiful, smooth blurred background. This zoom lens has a dust-proof and drip-proof construction. A fluorine coating minimises the amount of dust, dirt and fingerprints that adhere to the front and rear lenses – thus helping to maintain superior image quality and reduce the need for cleaning. A ring-type USM autofocus motor, combined with a high-speed CPU and optimised AF algorithm, delivers super-fast and near-silent AF with precision. It also provides full-time manual focus so that you can adjust the focus with the focus ring, without first having to switch the lens to manual focus. This allows you to adjust the focus accurately to ensure it is exactly where you want it to be for the most creative control possible. The Image Stabilizer in a Canon lens works by shifting a stabilizer group of elements to compensate for motion detected by a gyroscope in the lens. Once activated, the Image Stabilizer provides the equivalent of up to four stops of shutter speed, so you can shoot hand-held and capture acceptably sharp images at much slower speeds. For movie shooting with a tripod, the IS mechanism can be left switched on. The lens will detect it is mounted on a tripod and the IS optics will be locked in place so they cannot move. If vibration is detected the IS will then activate to remove vibrations. Applied to the majority of lenses in the Canon EF lens range, the Super Spectra coating helps to reduce reflections from the camera sensor that can otherwise cause flare and ghosting. The coating also helps to keep the colour balance of the lenses constant across the lens range, such that the colour characteristics of each lens are the same. UD lens elements are used to correct for colour aberration and produce a high contrast image with good sharpness and definition. The EF16-35mm f/4L IS USM features two UD lenses to provide the highest image quality possible. Keeping lenses clean is important to ensuring the best image quality possible. To help with this, both the front and rear lens element are coated with fluorine which acts as a non-stick, easy-to-clean surface to help with the removal of dust and dirt or oils left by fingerprints or from the atmosphere. Fluorine is also used on the filters covering the CMOS sensor in the camera and the rear LCD panels of several EOS models for the same reason.